Just sneaking in to share a card I made for the June Mix it Up challenge at Ellen Hutson, where we are playing with Altenew and Essentials by Ellen goodies. 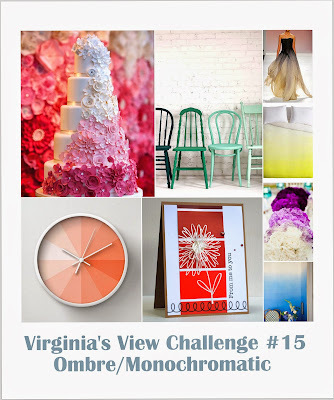 I'm also linking this up to challenge #15 at Virginia's View which has a monochromatic/ombre theme. I made a watercolour ombre background with Cracked Pistachio distress ink (LOVE that colour) on Distress watercolour cardstock. Then I had some fun stamping and embossing the beautiful floral elements from Essentials by Ellen Bohemian Garden in gold (Ranger superfine) on vellum cardstock. After die-cutting them all out I arranged them in a cascade from the top corner, using glue dots in the centre of each flower only so that they'd curl up at the edges. I backed the central flower with some gold glitter paper and white tissue paper to make it stand out a bit more. The sentiment is from Altenew's Label Love set, stamped in Versacolour Tropical Green pigment ink, and matted on black cardstock. I embellished with some gold sequins from Pretty Pink Posh and a patterned paper strip from Lawn Fawn to tie in the black from the sentiment strip. Thank you for looking, have a happy day! PS - thank you to everyone who left all the lovely comments on my first few posts, they really made my day! 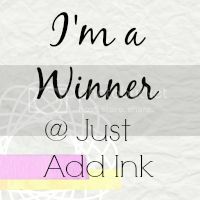 PPS - I was so excited to win my very first challenge at Just Add Ink! There were so many amazing entries that I feel very lucky to have won.